at² started developing mobile apps right from the beginning: Since around the year 2000 we develop software for all common mobile plattforms. A good app should not be just a new version of your website. Modern mobile devices offer all sorts of additional technology: Accelerometer, Bluetooth, GPS, camera, compass, vibration, voice and text services are mostly available and can be used to create wonderful apps. To ensure you get the most out of the vast possibilities, we see ourselves not just as the executive part of a project but rather as a partner to assist you in a professional manner, starting from the first stage of planning. 40,000 students of the Friedrich-Alexander-University of Erlangen-Nuremburg now have a new companion: the FAU campus app for iOS and Android provides plenty of useful resources which are needed for university's everyday life. One of the core modules of this mobile app is the lecture planner, where all events can be managed. It is connected to UnivIS, Germany's leading information database for universities. All available lectures can be searched and organized directly from within the app. Not many years ago, students had to create their schedule using simple pen and paper - now everything is available neatly on their smartphone. Being one of Germany's ten largest universities, it is only natural when freshmen get lost in its huge building complexes. Thanks to the indoor-maps-module, every single room of the Lange Gasse and Findelgasse has been digitally cartographed and can now be searched within a few seconds. Additional features will not be restricted to be programmed by our company: Thanks to the modular nature of our development, every student of the FAU will be able to add new functionality to the app. The people-module grants direct access to all UnivIS-based contact information on the whole university staff. Several news modules are now linked to the RSS-Feeds of faculties and schools. Thanks to the OPAC book search and its mobile ISBN scan feature, students can now directly order important books from their university library. Numerous external websites have been centralized into the FAU campus app. The glossary module synchronizes important reference works with the FAU WordPress websites. Canteen food might be the most lasting thing for some students. This is why we have integrated the canteen-module, which shows all meals throughout all university canteens for several weeks in advance. We're delighted that we were offered to develop this project for the Friedrich-Alexander-University. Each module had its own interesting technical challenge to be mastered by us. In the end, we were not only rewarded with this beautiful app, but also a nostalgic journey back to the times when we went to school ourselves. We wish all students of the FAU big success with their study and we hope that our app makes their lives a little easier. We offer app development for all common mobile platforms, including Android, Apple iOS or all Windows devices. Due to many years of development in the field of mobile software, we know the subtleties of each platform. You choose the type of device: We are happy to to develop apps for smart phones, tables, or any other mobile device. If the application is designed to run on different operating systems, the question on how to approach the implementation comes up. A "native development" always guarantees the highest compatibility but it has to be developed for each operating system on its own. "Hybrid development" reduces the effort by using the same code on different operating systems instead - mostly with a trade off in compatibility. To decide whether to choose the native or the hybrid option, it is crucial to take many parameters into account and to analyse each project on an individual basis. Benefit from our broad experience in both hybrid and native development. We are here for you to help you choose the right approach. For further information please review our in-depth article in issue 2/2013 of the print magazine "Digital Production". 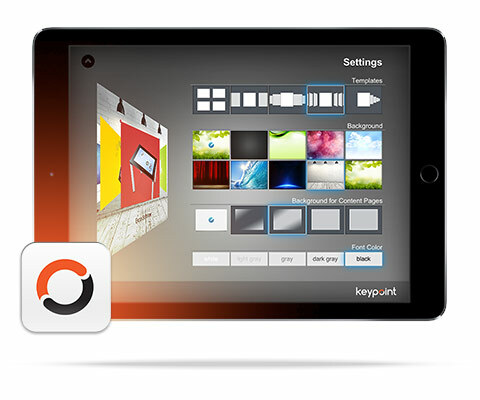 Create professional app-like presentations with just a few easy clicks in keypoint. We recommend to download and test it, it's free! We develop professional, individual and extraordinary software solutions in the areas of 3D, mobile apps, and software used at exhibits, fairs and presentations for business or private clients. Our software is exclusively developed in germany and individually tailored to your needs, focussing on the ease of use, flexibility in terms of extensions, highest quality and above all the attention to detail. Personal contact to our customers is important to us. So if you're near Kempten or Nuremberg, come and visit us. We develop professional, individual and extraordinary software solutions in the areas of 3D, mobile apps and software uset at exhibits, fairs ans presentations for business or private clients. If you want to learn more, just contact us. We're looking forward hearing from you soon.